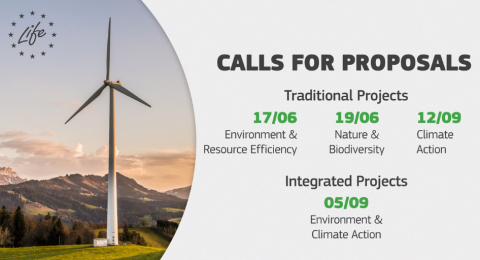 New calls for proposals under the EU LIFE programme are opened since April 4, 2019. They offer funding for projects under sub-programmes for environment and climate action. These sub-programmes cover a wide range of topics such as nature and biodiversity, resource efficiency, climate change adaptation and mitigation. They refer to traditional smaller projects and larger integrated projects which allow beneficiaries to receive and use funding from many sources, including the EU and/or national budgets and the private sector. Please also note that, until the United Kingdom leaves the EU, EU law continues to apply to and within the UK, when it comes to rights and obligations. This includes the eligibility of UK legal entities to participate fully and receive funding under the LIFE programme. Please be aware, however, that the eligibility criteria must be complied with for the entire duration of the grant. Application processes differ depending on the type of project you are willing to submit. To learn more about the application details, please visit the LIFE programme website. getting inspiration and learning from others by exploring the existing LIFE programmes, among which is the Oreka Mendian project. Please note that for most environment projects, the application deadline is June 2019. Most climate action projects proposals must be submitted by September 2019. For more information, please visit the LIFE programme website or read the FAQs. You can also directly get in touch with the LIFE national contact point in your country. 2019 LIFE open days are also coming! If you are seeking for more information or looking for partners, you can check out LIFE networking events and workshops happening near you.